Republicans and Democrats alike are dismayed by President Trump's comments at his joint press conference with Russian leader Vladimir Putin on Monday. Mr. Trump stunned onlookers by repeatedly defending Putin during the press conference from allegations that Russia interfered in the 2016 election and casting doubt on conclusions to that effect made by U.S. intelligence agencies. "Disgraceful" is also the word former Republican presidential nominee and current Utah senate candidate Mitt Romney used to describe the press conference. Romney, who was famously mocked for calling Russia "our number one geopolitical foe" during the 2012 presidential campaign, appeared to reference the line in his Monday evening statement. Ultimately, he called on individuals within the Trump administration to communicate with Mr. Trump that Russia did indeed meddle in the 2016 election "without delegitimizing his electoral success." Senate Minority Leader Chuck Schumer, criticized Mr. Trump's willingness to side with Putin over the American intelligence community's conclusions, calling Mr. Trump's words at the press conference "thoughtless, dangerous and weak." The Democratic leader also called for Mr. Trump to sit for an interview with Special Counsel Robert Mueller. Ari Fleischer, a Republican and prominent Trump defender who served as former President George W. Bush's press secretary, said that while he still does not believe Mr. Trump colluded with Russia in the 2016 elections, he understands now why people think he's being blackmailed. "I continue to believe there was no collusion between the Trump campaign and Russia. But when Trump so easily and naively accepts Putin's line about not being involved, I can understand why [Democrats] think Putin must have the goods on him," Fleischer tweeted. I continue to believe there was no collusion between the Trump campaign and Russia. But when Trump so easily and naively accepts Putin’s line about not being involved, I can understand why Ds think Putin must have the goods on him. Outside of his office, Sen. Bob Corker, R-Tennessee, said that Putin gained a "tremendous amount" from Monday's conference and that Putin is probably celebrating with "caviar." "He gained a tremendous amount," Corker told a press gaggle. "It was almost an approval, if you will -- a public approval by the greatest nation on Earth towards him. He knows he gained a lot. I would guess he's having caviar right now." At an Atlantic Council panel discussion, both Sens. Marco Rubio, R-Florida, and Mark Warner, D-Virginia, denounced Mr. Trump's behavior. 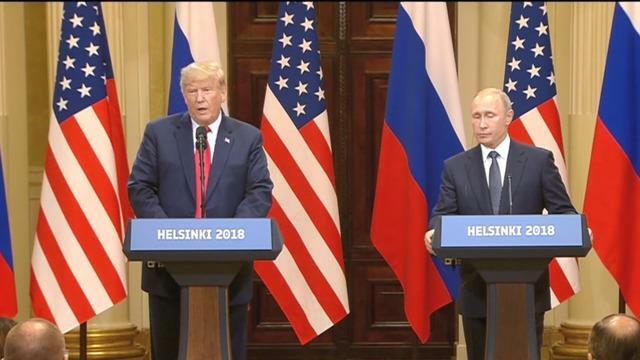 In a series of tweets after the press conference, South Carolina Republican Sen. Lindsey Graham, an ally of Mr. Trump, called the meeting with Putin a "missed opportunity" that would be perceived by "weakness" by Russia. Graham also said that, if it were up to him, the soccer ball Putin gave Mr. Trump would be checked for "listening devices" and never be taken into the White House. Retiring Arizona Republican Sen. Jeff Flake, one of Mr. Trump's most outspoken critics in the GOP, called the press conference "shameful." Nebraska Republican Sen. Ben Sasse, a sometime critic of Mr. Trump, took issue with the president's claim that the U.S. is in part to blame for the state of Russo-American relations. Following up on a tweet he posted early Monday morning, Mr. Trump said at the press conference that he holds "both countries responsible" for tensions between the nuclear powers. Meanwhile, Republican House Speaker Paul Ryan was more circumspect in his comments, but said Mr. Trump "must appreciate that Russia is not our ally." Democrats also criticized Mr. Trump's performance. John O. Brennan, who ran the CIA under President Obama, called Mr. Trump's comments at the press conference "nothing short of treasonous." And Democratic House Minority Leader Nancy Pelosi said the press conference proves "that the Russians have something on" Mr. Trump.